Mortgage applications increased 0.6 percent from one week earlier for the week ending Oct. 14, 2016. The refinance share of mortgage activity decreased to 61.5 percent of total applications from 62.4 percent the previous week. The average contract interest rate for 30-year fixed-rate mortgages with conforming loan balances ($417,000 or less) increased to 3.73 percent from 3.68 percent. Single-family authorizations in September were at a rate of 739,000, 0.4 percent above August 2016’s revised figures. 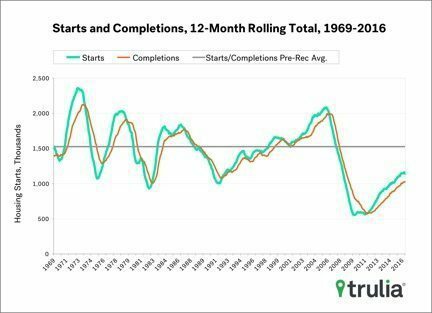 Single-family housing starts in September were at a rate of 783,000, 8.1 percent above August 2016’s revised figures. Single-family housing completions in September were at a rate of 687,000, 8.8 percent below August 2016’s revised figures. The average time to close all loans increased to 48 days in September 2016 from 46 days in August 2016. The 30-year note rate declined to 3.750. Closing rates experienced a slight decrease to 71.8 percent. The barometer (which tracks industry optimism in market improvements) posted high readings for Q3 across all industry groups. Architects reported a five-quarter decline in confidence in market gains. Remodelers and design-build firms reported that labor shortages are driving cost increases. Potential existing-home sales increased to a 5.8 million seasonally adjusted, annualized rate (SAAR). In September, the market potential for existing-home sales grew by 6.5 percent compared with September 2015. 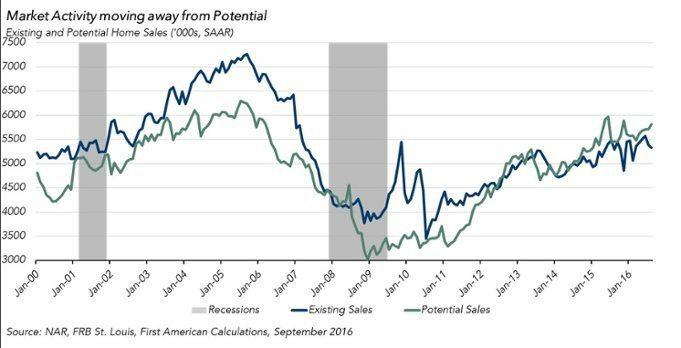 The potential existing-home sales is 351,000 (SAAR) or 6.0 percent below the pre-recession peak of market potential, which occurred in July 2005.